Kadare's The Traitor's Niche suggests that to belong to the state is to either be a part of the machineries of power or in rebellion against them—and occasionally both. What, to the Albanian, is the state? This is the question Ismail Kadare meditates on in his novel about the Ottoman Empire and its rebellious Albanian province. The Traitor's Niche (Kamarja e turpit, lit. "the chamber of shame") was written in 1974-1976 and published in 1978 during a thawing of Enver Hoxha's hostility toward the outside world, motivated in part by China's loosening of the once-tight relationship between the two states after the death of Mao. Despite this, the nation remained a strictly paranoid police state, as Kadare recalls in his recently translated novel A Girl in Exile (2018), an autobiographically inspired story about a playwright investigated by the state police and cultural censors at the tail end of Hoxha's reign. Kadare's newest appearance in English, rendered in poetic prose in a translation from the original Albanian by John Hodgson, was written during one of Kadare's most productive and artistic periods in the late '70s and early '80s, during which time he produced half-a-dozen novels, among them perhaps his best-known works in English, The Palace of Dreams (1981, trans. 1993) and The Three-Arched Bridge (1978, trans. 1997). 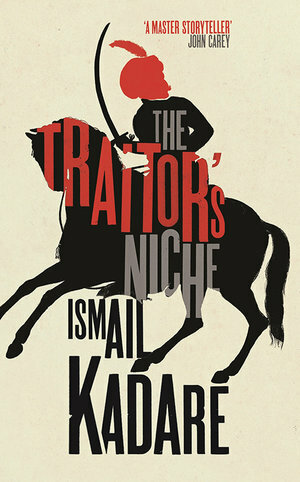 Traitor's Niche has been a longtime lacuna for Anglophone readers of the Albanian novelist, and all the more so since it extends the pseudo-historical, pseudo-fictional world of the pre-20th century Ottoman Empire and its bureaucracy that Kadare has charted in other novels; in particular, Traitor's Niche provides the worldbuilding spark for The Palace of Dreams, about the eponymous mysterious ministry in the Ottoman political machine whose task is to collect, spy on, and interpret the dreams of the empire's subjects ("slaves of the sultan"). The novel also spends several pages recapping the story of imperial infrastructure and its local violences in The Three-Arched Bridge, an homage to Bosnian author Ivo Andrić's seminal novel The Bridge on the Drina (1945, trans. 1959). The worlds of Kadare's historical-allegorical novels intersect and are shaped to the story at hand. In Traitor's Niche, for example, the Palace of Dreams is but one of dozens of state institutions structuring the violence of the everyday lives of subjects/slaves, minor officials, and venerated pashas alike, though it takes on a life of its own, becomes a singular stand-in for the state, in the later novel. In the Ottoman Empire of Kadare's historical allegory, as in Hoxha's Albania, no one is safe from the state. In this bleak vision, even Hurshid Pasha, the triumphant suppressor of Ali Tepelena's revolt in the Albanian province, loses his head after a dream is deemed potentially threatening to the state. The state, its simultaneously monotonous and labyrinthine institutions, and its actors (its victims-to-be) are mapped in exquisite detail against the political backdrop of rebellion in the Albanian province of the Ottoman empire c. 1820-1822, but like his most lauded novels in the Anglophone world—and temporarily proving Fredric Jameson's thesis that all "third-world" literature is allegory—Traitor's Niche is an historical allegory, and so cannot be contained by the allusions to real-life figures it draws on to tell the story. Much more is fantasy, here, than allusion, but from the fantasy emerges the state's imposing edifice, glimpsed, to be sure, in the history of Ottoman rule in the Balkans, but also in Hoxha's police state and the Soviet Union, and beyond that the abstacted concept of "the state" itself. The novel also offers a clear ethical position on the subject's relation to the state: constant rebellion. The long history of Ottoman rule and of local struggle against that rule has remained a trademark of the Balkan historical (and more often, historical-allegorical) novel in much the same way that the medieval and early modern periods ruled the scene of Western Europe's historical novel in the 18th century. For a people whose history has been one of imperial subjugation (by the Romans, by the Byzantines, by the Turks) and later of tyrannical oppression (arguably, under King Zog in the '20s, and clearly under communist rule, 1940s-1990s), the Ottomans whose rule lasted 432 years, give or take brief periods of revolt, prove a useful cypher for representing the tragedy of life in Albania under the paranoid leader Hoxha. Traitor's Niche, as the title suggests, explores moments of dissent against the Ottoman state, whether the dissenters in question ever saw themselves as rebels or if the state labeled them as such out of convenience. In broad strokes, the book tracks the stages of a state's response to rebellion and in the process maps the mechanisms of the power of the state. Like a novel version of Benedict Anderson's Imagined Communities, Kadare gives great attention to the aspects of the state that maintain, reify, and extend its operations. Newspapers, archives, monuments, public squares, proclamations and decrees, maps and borders, government ministries and officials, banks and stocks in public goods, and the social sciences—each of these, in their own way, takes on narratives significance, is ruminated on by the omnipotent, transhistorical third-person narrator, and is the professional concern of various characters. Like most Kadare novels, in Traitor's Niche characters are few and characterization sparse; they bear historical and political weight much more so than narrative. Several, like Hurshid Pasha and Ali Tepelena, are real and offer a chance to consider the failures of figures like Tepelena to vouchsafe the Albanian people. But most are not real, like Tundj Hata, the paranoid and bitter imperial courier of severed heads, or Abdulla, the marriage-troubled guardian of the Traitor's Niche where severed heads are displayed as a monument to the state. For these minor officials, the state provides both the context of life but also the pretext for the surveillance and loss of life, whatever the topsy-turvy bureaucratic whimsy of the state. Through these minor officials, Kadare's novel suggests that to belong to the state is to either be a part of the machineries of power or in rebellion against them—occasionally, as with Tepelena, both. In the twist of allegory, Kadare tells a story about Ottoman Turks that reveals itself to be a lesson in the ethnic history of the Albanian. For the non-Albanian reader in 2018, it must be clarified that Kadare's position is not one of nationalism or ethnic pride in the sense we mean today. Rather, Kadare signifies something more specific to the Albanian experience of the past 600 years, distilled in Traitor's Niche at the height of Enver Hoxha's reign through the historical allegory of the Ottoman Empire. The state, to the Albanian, is an imposition; it is, pure and simple, a violence against the people. The Albanian seeks independence, not only from colonial rule, but from rule itself. And here is the grand ethics of Kadare's novel, the rejection of sovereignty that reads to communist censors as anti-imperialism, and is, but that also rejects the whole project of the nation, of empire, in a narrative set amidst the great nationalist revolts of the 19th century Balkans. The Traitor's Niche masquerades what appears today to be an ethnic-nationalist claim fetishizing the rebelliousness of the Albanian people, but which, beneath the surface of Kadarean allegory, allows instead the pessimistic claim that the reign of any sovereign over Albania has been and will be as historically brutal as the most violent, anti-independence days of Ottoman rule. To the Albanian, to Kadare, the increasingly internationally prominent novelist residing in Hoxha's Albania in the late '70s, the state is the antithesis of the grand legacy of Albanian unruliness and revolt against a millennium of outsiders. Seeing his allegory as the story not only of Albania but of the Balkans (here, the Ottoman term for the province of that "insane peninsula", Rumelia, is substituted with "Albania") and of humanity generally, Kadare's Traitor's Niche is a short, rich, thickly described indictment of empire, nationalism, and the state, a timely meditation on the violences of bureaucracy, corruption, and the injustice of justice. Its ethics are encoded in the titular Ottoman monument; we should all act in life, so that in death our heads peer out from the Traitor's Niche, lifeless eyes glinting in condemnation of the very thing we are set watch to memorialize.